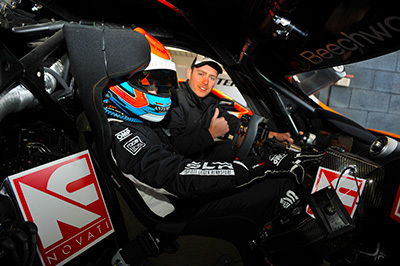 Coming into round 4 of the Australian GT championship my co-driver Elliot and I were both excited and very eager to get back into the Beechwood Homes/SLR/BuildMat McLaren 650s GT3 after our strong performance in the last race at Perth a few weeks ago. Practice one on Friday morning was very promising. I started the session and was immediately confident with the set up, but already thinking of how we could improve. Elliott got in to finish off the 30 minute session after I had made some minor changes and was able to bank some solid lap times and gain some knowledge on how to further improve the car for qualifying. Elliot started the first Qualifying session. It was a very difficult scenario. 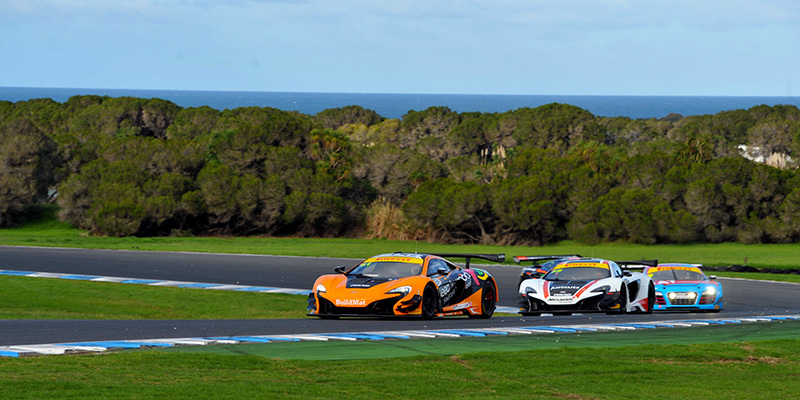 The circuit started wet and a few cars including the Tekno McLaren trio started on wet tyres to get a gauge on the circuit and build some heat through the brakes. A quick pitstop and tyre change onto slicks with 12 minutes to go meant that Elliot had to really get some tyre temperature on a half wet track and be as precise as possible. If he put a wheel off the dry line onto the wet surface of the track, it could be all over in an instant. He did a remarkable job to finish the session in 1st with a time of 1:28.3, more than half a second in front of the next best. It was my turn for Qualifying two. During our 10 minute change over between sessions we learnt that there was going to be a slight issue which meant I could only do a maximum of three laps. The pressure was on. There would be no time to get heat into the tyres because the weather outside was just too cold, so in my first two laps I had to get as much temperature into the tyres and breaks for one flying lap. It was very committed and I had to trust my theoretical knowledge of what the car could do because my brain wasn’t wanting to go so fast on cold tyres. I managed a time of 1:27.1 which put me 4th for the session and starting 4th in race one. I was happy with the speed considering the circumstances, but looking back in frustration, knowing that it could have been even better if we hadn’t encountered an issue leading into the qualifying session. Race one started off perfectly. I was in the car for the start and got a great jump to get to 2nd into turn one and was able to comfortably hold this position behind the Audi of Garth Tander. I didn’t need to push to try and gain the lead because his pitstop was a lot longer than mine. About 10 laps in, Garth had some dramas and I took the lead just before my pitstop window opened. Just before pit window opened, the safety car was deployed. A miscommunication and miscalculation resulted in me being pitted one lap too late, and Elliot and I got pushed back from 1st position to 21st and one lap behind the leaders. This bungle meant the race was pretty much over for us. 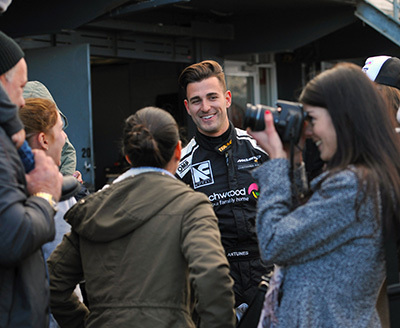 Elliot Brought the car home strong and the best he could do was help gain knowledge to improve the car for race 2. Elliot was in the car for the start of race 2. Straight away he showed the strength that we were able to build in the McLaren, and made his way up to 14th position before being run off the track by one of the BMW M6 GT3 entries, forcing him to take to the grass to avoid a collision. Pushed back to 20th, Elliot again worked his way up the field to 12th before handing over to me to finish the race. The car felt great and I got my head down focused on a strong finish. It seemed like there was a theme to this race and I too found myself being pushed onto the grass to avoid an accident, this time funnily enough by my car from last years’ championship. I had to keep clear of drivers struggling not to crash themselves and had a great battle with Bonanomi in the Audi R8 LMS slicing our way through the field. I got up to 6th position, and with just 3 minutes to go, I suffered a tyre puncture. Luckily I was able to make it back to the pits without damage to the car, but the race was well and truly over. We finished in 25th. 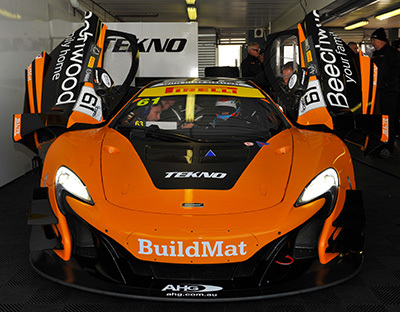 The whole Tekno Autosports McLaren team were gutted knowing how strong our car speed was over the weekend. We are all hoping for better luck for the end of the year, but I believe in creating your own luck and the best I can do is to do my job the best I can to take my team and my sponsors to the podium as often as I can. Thank you to Beechwood Homes for being there with Elliot and I. Your support is invaluable. And thank you to Novati Constructions for bringing us the awesome on board footage. I know I’ll be watching the start of race one again to re-live the excitement! 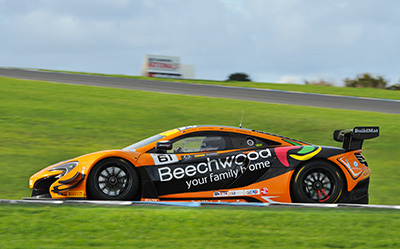 Next round is on the streets of Townsville in Queensland where I have had success in Australian GT the past two years. Join us as we continue the success this year!